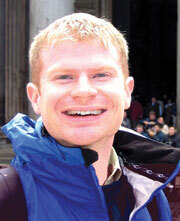 Sean O'Neill is the senior editor for online at Budget Travel. O'Neill spoke with PRWeek about budgettravel.com's social media features, the growing importance of video, as well as some of his day-to-day duties. PRWeek: To start, can you talk a bit about your day-to-day role as senior editor of Budget Travel online? Sean O'Neill: I have a couple different duties. I'm the blog editor. We have a blog that is updated on weekdays, and it contains a mix of destination information and breaking news, tips and strategies, and topical questions that draw reader comments on topics such as ‘shouldn't airlines charge for bathrooms?' In the past we've also gotten a lot of comments about security procedures. People feel very passionately about those topics. I'm also the features editor for Web-exclusive stories that are specific to how to travel now. So strategy on how to better use the Web to find deals, or, for example, I assigned a story about duty-free shopping and whether there is any value there, and what types of products have the best discounts. We have destination coverage here as well and the best person for that is the destinations editor, Kate Appleton. Another thing I do that is destination-specific is coverage of London. Our staff is broken up for about a handful of cities that we give intensive coverage. I also do Web original hotel reviews, assign and edit video, and Twitter and other new media experiments. PRWeek: What are some ways that budgettravel.com has evolved over the past few years, or even in the past year? O'Neill: We've tried to take better advantage of the medium. In the past six months, we've tried to create more interactive features. So for example if you go to www.budgettravel.com/nonstopcaribbean, you'll see that we have sort of a flash map. You can enter in your departure city and a Caribbean island and it's a trip-finding feature. It's interactive with maps, photos, and deals. Budgettravel.com/realdeals has a list [compiled] because everyday we review a vacation package. We identify why it's a good deal, and then we collect them on this page. If you go down towards the bottom of the page, you can find more deals by country, state, city, and all types of interests. So that part on the bottom there is trying to make it easier for [people] if [they] want more information on a given topic. We have this wealth of archived information, of Web-original information, and we're trying to make it easier for readers to be able to find it and drill down when they want more on a particular topic. PRWeek: What seems to be the most popular section of Budget Travel online? O'Neill: I can't say; it seems to be all pretty equally popular. PRWeek: Do you find your readers are really interested in adding their own content through the site's different social media features? O'Neill: Since last summer, we rolled out our social media feature called ‘my Budget Travel.' And we have thousands and thousands of people that are in there on a regular basis who are creating travel journals, they're uploading videos and photos, they're making friends with each other. And then we select the best of those photos and use them on our Web site and occasionally in the magazine. The magazine had a reader generated issue last June, and we're continuing to have initiatives like that going forward. PRWeek: Has the number of people pitching budgettravel.com, or even the magazine in general, increased recently due to the poor economy? O'Neill: I think the number of pitches has been about the same. A lot of people have been trying to pitch on the fact that rates have dropped, and that's not always enough of a hook. We're more interested in sort of what's the value proposition - what's interesting, what's new, and if there's any kind of inventive promotion. PRWeek: Going with that, can you talk a little more about what works for you and what doesn't work for you in terms of being pitched? O'Neill: I think a cardinal sin is misrepresenting or being misleading about what you're talking about. Sometimes publicists and PR specialists will present some service as being new, but it's sort of a vaguely worded press release, when in fact the service has been around for several years and all that's been added is some new attributes or something. Also being savvier about making use of the Web is helpful. For example, a company had a product that was a new billboard service for airports, and the billboards would be flashed on the floor of the airports, and as passengers walked across them the billboards would sort of change and [become] animated. And this was a great service discovered in a press release, but it's the kind of story that's sort of hard to put into words; it's best to have a visual. So I went to YouTube and found [that] some user had created a video of the service [from] an airport. I posted [the YouTube video] and then that blog post was picked up by other media outlets that linked to it - so having a video component when it's appropriate and including a link to something is helpful. I realize it's hard because sometimes the client can take control of that kind of thing and they want something very highly produced and that's not consumer facing, but when [we do get videos] it really helps us to be able to tell the story. PRWeek: Can you talk a bit about the most unique thing you've covered on the Web site, whether its something maybe people wouldn't expect to be covered by Budget Travel, or just something you thought was really interesting? O'Neill: We try to stretch the bounds a bit. I'm not sure I can say what I think is most unique. Some things might come outside the bounds. We had an article about the 10 best places in the world to propose, another of the 10 weirdest hotels in the world. I think our coverage of security issues is something that's not strictly about getting a good deal on airfare, but it affects the experience of travel and people feel very passionately about it...security issues are something people might not think of when they think of Budget Travel. PRWeek: Are there any travel trends in particular that you've been following lately? O'Neill: Unusual promotions - for example, Vegas.com had a promotion where you go to the Web site and enter in the word ‘rage' to vent your anger about the economy, and you [got] $25 off hotel rooms and show tickets. So that was a kind of playful [promotion]. So some of the trends we are trying to look at are fresh takes, and upbeat takes. There's kind of a constant dread of bad news, and we'd like to try and remember fun and remember that travel is about fun. Everybody already knows there's a recession...we're more than just talking about the price of things, and we definitely don't want to focus on being cheap. We're really about the value of the experience.